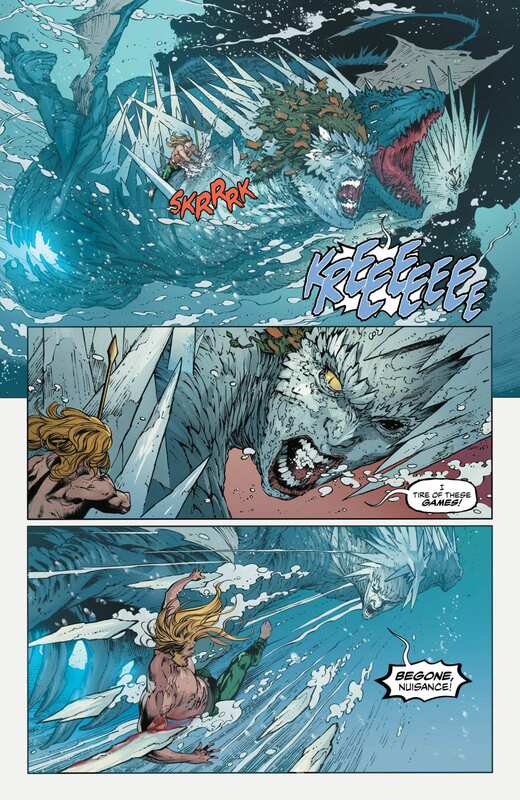 AQUAMAN #47 is stunning piece of art that wraps up the "Unspoken Water" storyline quite nicely. 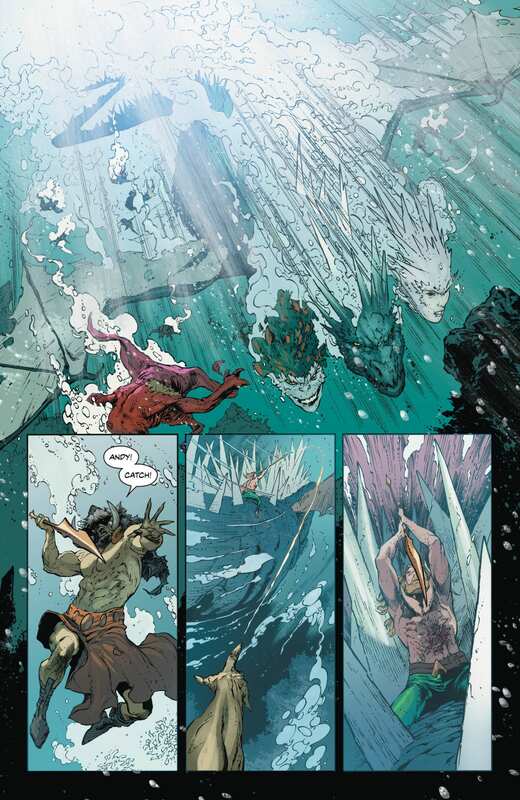 Aquaman’s journey with the Old Gods finally comes to an end in AQUAMAN #47. Mother Salt, the co-creator of the ocean, is mustering up her primordial powers to flood the earth with her bitter salt water. 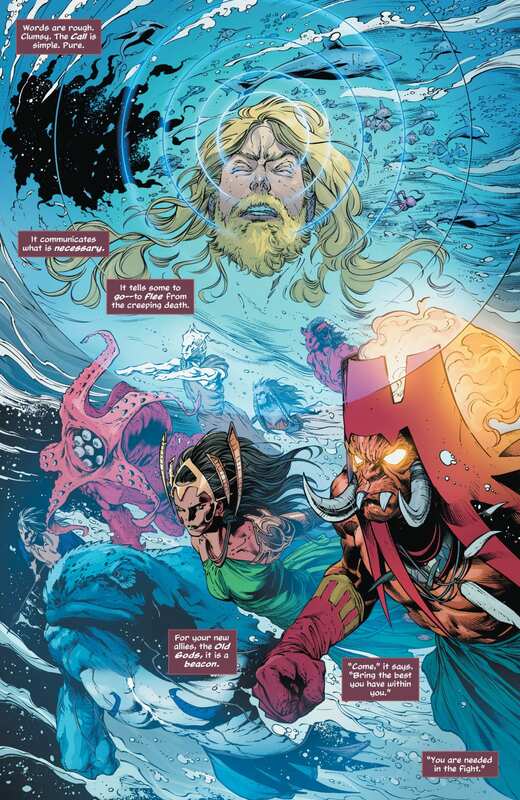 Aquaman (now known as “Andy” after losing his memories) calls out to every sea creature to take on the deity. 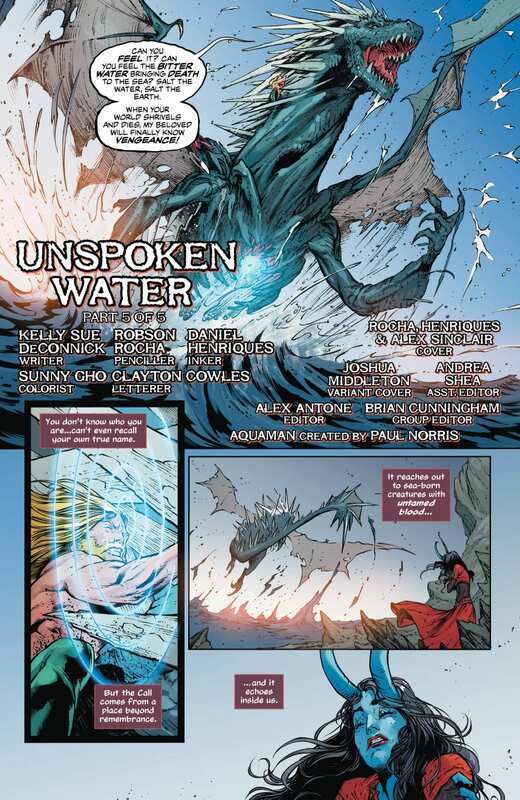 But will it be enough to defeat her in the final part of the “Unspoken Water” storyline? Andy’s famous “Call” ability to enlist the help of sea creatures is known to turn the tide of many a battle. The only difference this time is who answers. And lo and behold, it’s the Old Gods in their fully realized forms. The beauty of Kelly Sue DeConnick’s writing lies in its fluidity. Much like the water this story is set in, the scene transitions are incredibly smooth. This is an effective technique that keeps the reader engaged when a lot of separate events are taking place at the same time. We’re able to follow the events in a connected trail instead of bits and pieces of action. With the Old Gods at his side, Andy prepares for a battle with a power that formed the sea. Readers are pulled into his anticipation of the fight like a tide. But with this anticipation comes the fear of what would happen to the world if they fail. Sunny Gho, Robson Rocha, Clayton Cowles, and Daniel Henriques produced stunning visuals for this issue. Rocha’s penciling and Henriques’ inking combine to create solid lines to define the characters in the midst of wavy haze of sea. This meshes quite well with Gho’s aquatic hues, setting the scene of this story’s torrential battle. Clayton Cowles’ lettering provides effective differentiation through character dialogue. 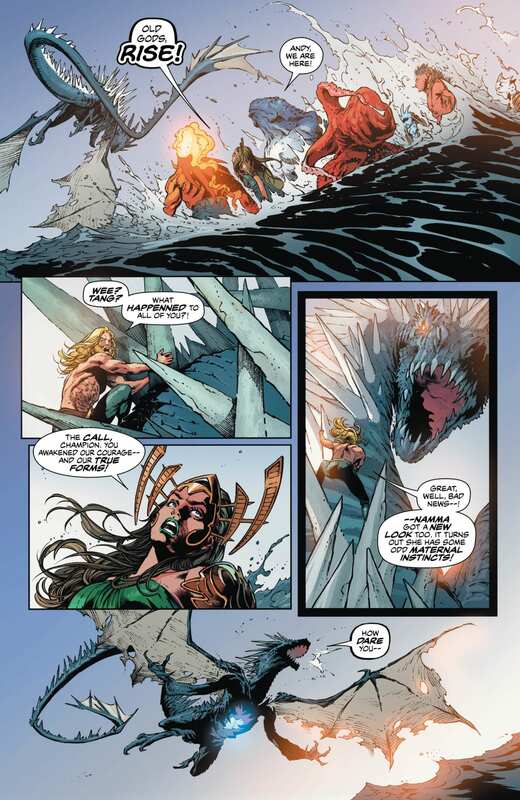 The varied shapes of speech balloons emphasizes the intensity of dialogue, such as Mother Salt’s jagged font style to help readers imagine her shrieks. Rocha, Henriques, and Alex Sinclair’s work on the main cover fits perfectly with the story inside. The artwork showcases Andy and the Old Gods in their fighting stances as they prepare for battle. 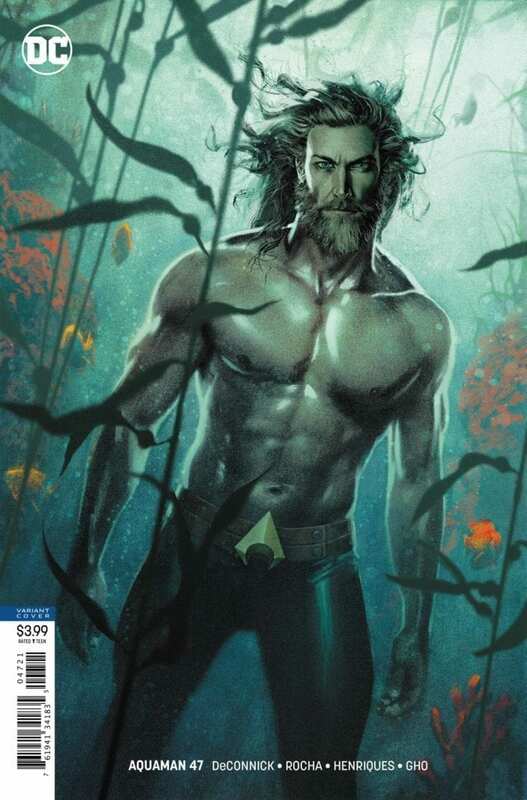 In addition, Joshua Middleton’s variant cover offers a hyper-realistic depiction of the aquatic hero to remind us how human he feels after losing his memories. 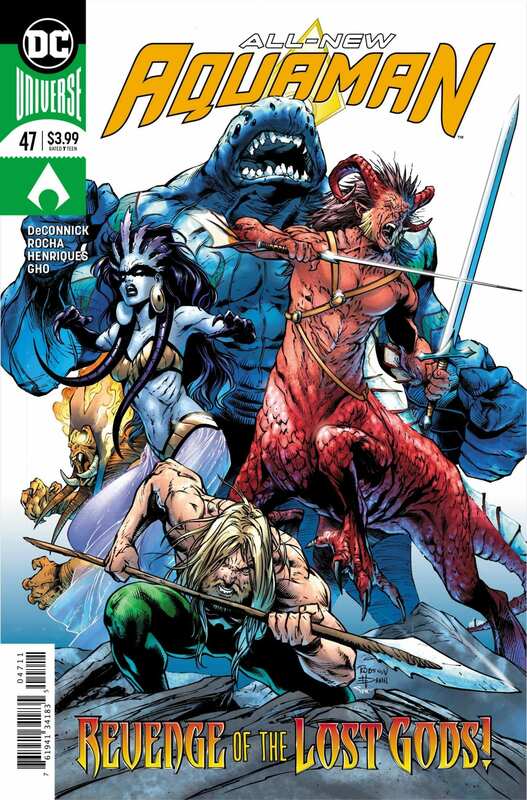 AQUAMAN #47 offers a thrilling conclusion to the “Unspoken Water” storyline. It’s filled with the drama and intrigue readers expect from such climatic battles. Did you like the conclusion to “Unspoken Water?” Let us know in the comments below!